SHOWTIME Sports® will close out a banner year of world-class boxing with back-to-back Saturdays featuring heavyweight world championship fights live on SHOWTIME. 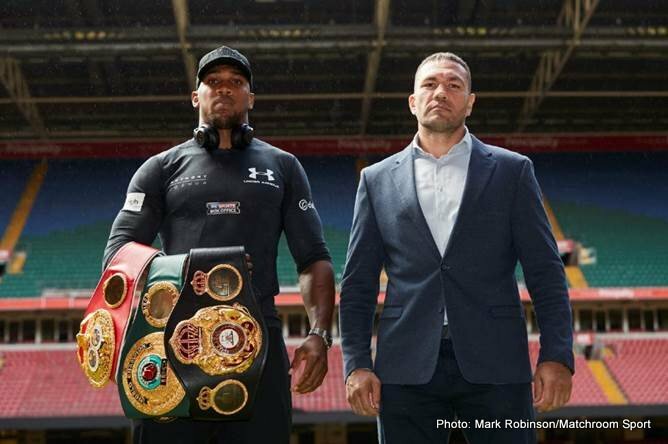 The network announced today coverage of unified heavyweight world champion Anthony Joshua’s upcoming WBA and IBF world title defense against top-rated mandatory challenger Kubrat Pulev on Saturday, October 28 live on SHOWTIME from Principality Stadium in Cardiff, Wales. The October 28 SHOWTIME CHAMPIONSHIP BOXING telecast will be the first of two heavyweight world title fights airing live on SHOWTIME on consecutive Saturdays, with WBC World Champion Deontay Wilder set to defend his title against undefeated contender Luis Ortiz on Saturday, November 4. Both main event bouts will air live on SHOWTIME as the network concludes a robust 2017 boxing campaign that will have featured 22 world championship fights, 16 bouts matching fellow undefeated fighters, three world title unifications, three world title rematches and the emergence of three bright young stars (Errol Spence Jr., Gervonta Davis and David Benavidez) as they earned their first world titles. With the addition of Joshua vs. Pulev, four of the consensus top-five heavyweights in the world will compete on SHOWTIME in consecutive weeks. Joshua vs. Pulev and Wilder vs. Ortiz will be the ninth and 10th heavyweight world championship bouts to air live on SHOWTIME in the last two years. Joshua, the undefeated British superstar (19-0, 19 KOs), exploded onto the world stage in April when he defeated heavyweight legend Wladimir Klitschko via a spectacular come-from-behind knockout. In the year’s leading Fight of the Year candidate, a bout that aired live on SHOWTIME, Joshua picked up the vacant WBA heavyweight title to go along with his IBF belt. Now, Joshua returns to take on the top-ranked IBF challenger in Pulev (25-1, 13 KOs) at the 70,000 seat national stadium in Wales. Joshua, 27, has remarkably knocked out all of his opponents since turning pro shortly after winning gold in the 2012 Olympics. The Watford, England native won his first title with a second-round KO of defending IBF Heavyweight Champion Charles Martin in April 2016, earning a heavyweight belt in the fewest number of fights in more than 20 years. He has since successfully defended the title three times – against Dominic Breazeale in June of 2016, Eric Molina in December and Klitschko in April. Pulev, of Sofia, Bulgaria, will be making his second attempt at winning the IBF world championship, having lost to Klitschko in his first try in November 2014. After that, his lone loss, Pulev quickly rebounded and became a two-time European champion with a win over Dereck Chisora. He also holds wins over two former world title foes of Klitschko in Samuel Peter and Kevin Johnson. Joshua vs. Pulev is promoted by Matchroom Sport. Fewer than 200 tickets remain on sale via www.StubHub.co.uk priced at £300.